Portable Bluetooth speakers have been appearing in their droves over the last few years, at a range of different price points, from manufacturers both known and new, making the qualm of which to buy all the more trying. Denon may have just solved that problem though, by introducing the Envaya Mini, a £99 portable Bluetooth speaker which, despite its small size, delivers frankly massive audio output. Can it do no wrong? Given its price point, the Envaya Mini is a very well crafted piece of kit, comprising a white metal grille covering an orange backing, offering a dash of visual flair and colour, with the Denon logo sitting proudly to the centre. There's a black and blue finish option also available, but we think the white and orange is the better looking of the pair. Unless you suffer trypophobia, in which case those circular openings in the grille might get you all itchy under the skin. Both ends of the Envaya Mini are finished in a protective rubberised material, which projects a little wider than the centre column and contains the feet for the product to sit in its horizontal position. On one end there's the power, volume and play/pause controls, while at the other you'll find the microUSB charging port and 3.5mm inputs. It's possible to flip the product vertically to stand as an upright mini tower if you want too. The Envaya Mini is water-resistant too, elevating it to the standard of the Ultimate Ears UE Boom, despite the Denon's smaller 210 x 54 x 51mm scale. There's a flap covering the inputs to avoid any nasties getting in there, which can be easily prised open when charging or when using the physical line-in. There's even a soft-touch blue carry pouch included, making a case for carting this 500g mini around with you wherever you go. We've seen stacks of portable Bluetooth speakers in the past, with the assumption being that one as small as the Envaya Mini means limited audio. But that's not the case, as this mini delivers mighty sound. It's genuinely surprised us. Initially we did struggle to get a Bluetooth connection, but that was down to us having a pre-production manual in hand, which failed to detail a necessary press-and-hold of the play/pause button to make Bluetooth discoverable. With the new manual and information in hand, button pressed, the Envaya Mini became visible in double-quick time and we've had no problems connecting from both Mac and Android phone for the duration of this review. NFC is also on hand for one-touch connectivity with compatible devices. Indeed, it's possible to have multiple devices connected simultaneously (up to eight), so you needn't go through the process of seeking and connecting from different output points each time. It's not possible for multiple devices to deliver audio simultaneously of course, which avoids a clattering audio mess. There's no distinct Envaya app available, but there is a Denon Audio app if you want to manipulate equalisation and source internet radio stations. Other apps, such as when streaming from iTunes, can present their own independent EQs for manual adjustment to your tastes, but we didn't find it necessary. The thing that all so often lacks in portable Bluetooth speakers is bass. No so the Envaya Mini, which has plenty of low-end prowess thanks to its 40 x 83mm passive radiator. It makes kick drums thump powerfully, while bass hums along in a fashion few other portables at this scale can offer. So much so that in its vertical position the Mini wobbles about like a mini skyscraper in a bass-provoked earthquake. Although bass is prominent, it's not so overpowering that it drowns out the remainder of the frequency range. The Envaya Mini capably handles vocals, synths and buzzing guitar riffs from its twin 40mm drivers, while high-end sparkles. We can't pretend that this Denon is about neutral audiophile audio, though, as it's far from that kind of product. Everything is pushed, maxed out - the MaxxBass, Maxx Treble, and Maxx3D trademark technologies are enough to tell you that - to give thumping output. But it's no bad thing: it's exactly what we want from such a product. With aptX compatibility, Denon complies with CD audio quality over the airwaves too, and we found the Bluetooth range sufficient to play a whole room away from source device. There's only one thing we would change in terms of design: a steeper incline to the front would project sound a little more upward and direct to the ears from a desktop position. 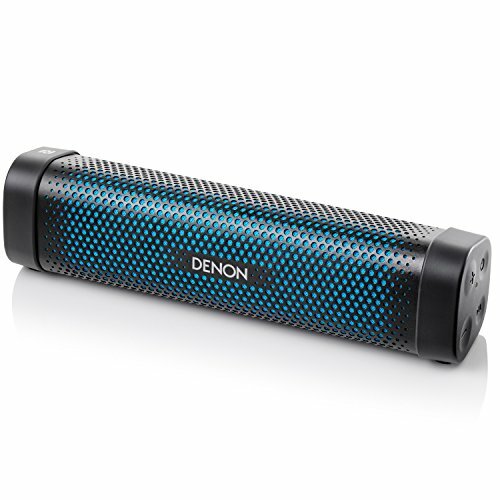 Unlike the UE Boom, which is cylindrical and emits a 360-degree sound, the Denon's use of a bass radiator means the Envaya Mini has as more of a sweet spot, but for personal listening that's not a huge downside. And it's loud enough to fill a room. Lastly there's battery life, which is said to deliver 10-hours per charge. That will depend on output volume, as when banging out the beats at ear-ringing levels we achieved around five hours from the first charge. Second charge around, after recharging for two and a half hours, and with the output volume set to a more "normal" level, we still didn't reach the claimed 10-hours - so while battery life is fine it's not outstanding. A faster recharge would be well received too, but given the price point that's probably a tall order. The eye-catching Denon Envaya Mini is a mighty portable speaker capable of delivering big, burbling bass and quality audio over the airwaves. Genuinely portable, with its own carry case included, we can't think of a more desirable sub-£100 small-scale Bluetooth speaker out there right now. Although there's no Wi-Fi/Airplay connectivity, the battery isn't as long-lasting as claimed, and we would prefer a steeper incline to project the sound up from typical desk height, those are minor quibbles in what is otherwise a top product. Don't be fooled by its small and unassuming size, at this price point the Envaya Mini is as good as portable Bluetooth speakers come.